April is here! And here's what I'm aiming to read this month. The Girl with All the Gifts by M.R. Carey was a gift from my Broke and Bookish Secret Santa last year. I've been looking forward to this read and have been trying to keep away from spoilers, so I'm not sure what all I'm in for, but looking forward to the ride. A Walk in the Woods by Bill Bryson is being turned into movie. When I was at my aunt and uncle's cabin a few years ago, I found a copy there and started reading through it. So, when I found a copy at a book sale, I snapped it up. Blue Like Jazz by Donald Miller us described as a sort of Anne Lamott style book. So, of course I had to give it a go. It's been sitting on my shelf for months but decided it was time to dust it off. 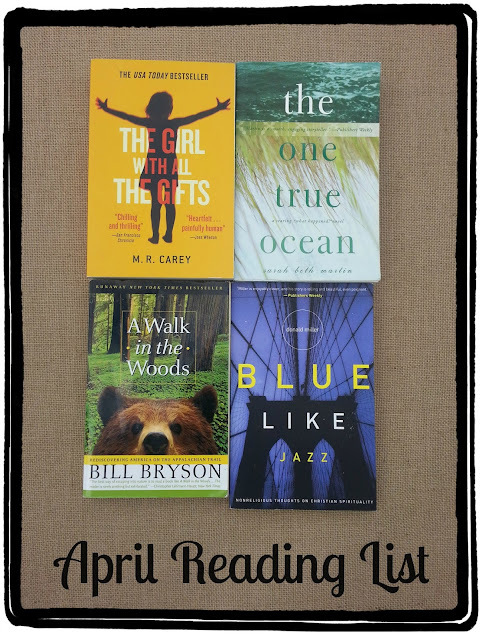 What's on your reading list for April? Walk in the Woods one of my favorites! Especially since at one time I thought about walking the Appalachian Trail. And now in Montana with bears! A fun read. Then go for a hike. I had liked the little bit that I had read, so I'm looking forward to finally reading the whole thing.